Solid aluminum metal paper weight knuckle. Weighs only 2.5 oz or 69 grams. 4-1/4 inches wide, 2-3/8 inches deep, and 7/16 inch thick. No stud, just a lightweight knuckle paperweight. 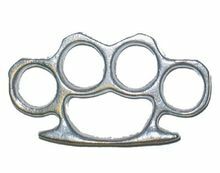 Made entirely of cast aluminum from a sand mold in Tichjardson, TX. .
Brass Knuckles of any material are not legal and therefore cannot be sold to people in the states of: MA,CA,NY,MI,RI and IL Metallic Knuckles may not be sold to FL.